Let’s face it. There’s a shortage in raw vegan Asian dressing recipes. I posted the raw vegan Japanese onion dressing recipe previously, but that’s not nearly enough to fill that giant void. Thus, my quest continues. 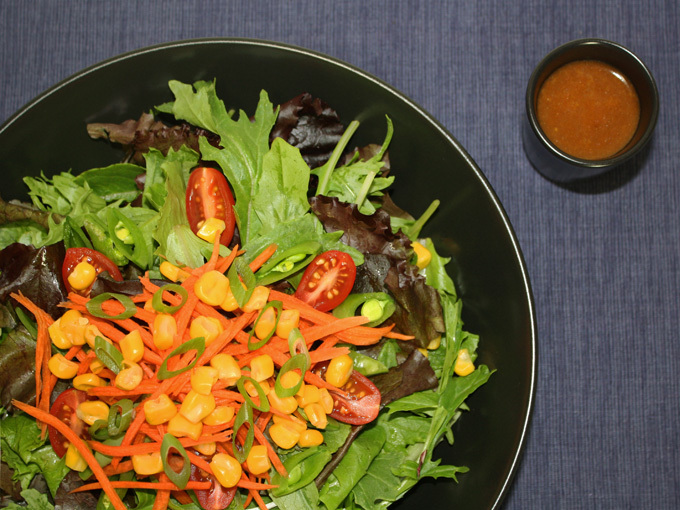 So here’s a raw vegan miso ginger dressing recipe for you. All you do is mix the ingredients! You’ll be done in 5 minutes! Say good-bye to store bought dressings taking over your refrigerator. You’ll never buy another miso dressing again. I’m sure almost all of you have had miso soup before, so you would generally know what miso tastes like, more or less. 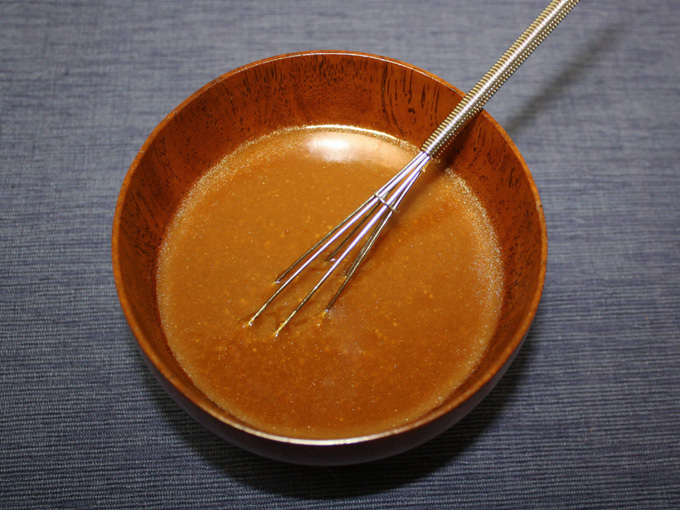 Miso is a fermented soy bean paste, one of the essential condiments in Japanese cooking. There are many types of miso, but that’s a whole conversation on its own, so I’ll just touch on the major ones. In a store, you’ll generally find white miso and red miso. The difference between the two, is how it’s made, the color obviously, and taste. In a nut shell, white miso is made from cooked soy beans and is fermented for a shorter period of time. It has a pale yellow color, and has a mellow, mild, sweeter miso flavor. 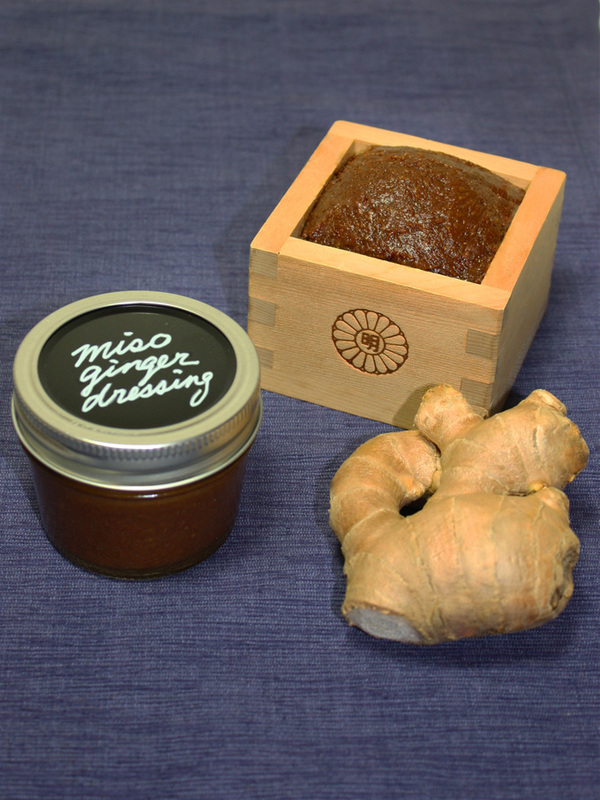 Red miso is made from steamed soy beans, and is fermented longer, it has a warm rich brown color as in the picture above, and has a rich, intense, savory miso flavor. In this recipe I am using red miso. 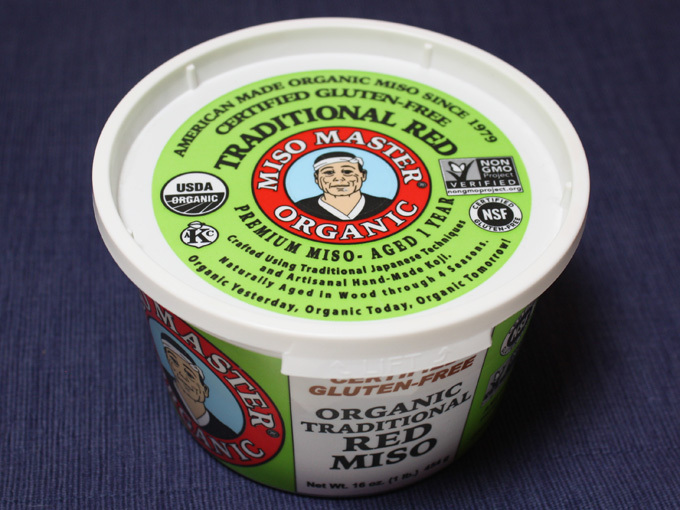 When choosing miso, make sure you go with organic to avoid GMO soy beans, and unpasteurized so you get maximum enzymes. I like Miso Master brand. If you are a vegan, you should have miso in your refrigerator, just because it contains B vitamins including vitamin B12, one of the essentials for us veg-heads! It’s also packed with anti-oxidants, probiotics, it lowers cholesterol and helps protect against radiation. Good stuff! Now let’s make this miso-tasty dressing! Add all the ingredients except for the olive oil and toasted sesame seed oil in a small bowl. Mix well with a whisk. Then whisk in the oilve oil and toasted sesame seed oil and stir until the oil is emulsified. Aaaand you’re done! This makes a thicker dressing, so if you prefer it thinner, add some water. Make sure if the taste gets too watered down, you adjust it. Drizzle it over your salad and you have a nice Asian salad. There you have it, Asian dressing #2. You’ll have #3 very shortly. Now, dig in! Add all the ingredients except for the olive oil and toasted sesame seed oil in a small bowl and mix well with a whisk. 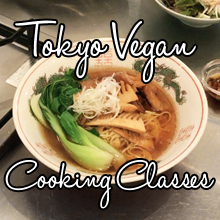 Whisk in olive oil and toasted sesame seed oil and stir until the oil is emulsified. This makes a thicker dressing, so if you prefer it thinner, add some water. Make sure if the taste gets too watered down, you adjust it. Keeps for 1 week in the refrigerator. If you added water, it'll only keep for 3 days refrigerated. Great Recipe. Would you please recommend a raw substitute for the toasted sesame seed oil? I am thinking of using raw tahini paste or raw sesame oil, though I am not sure if they would be taste similar to the toasted version. Thanks! Thank you very much for your comment! Toasted sesame oil is one of those thing that doesn’t really have a good substitute, kind of like say nutritional yeast. Nothing really replaces it 100%. Though it may not be raw, because the amount you usually use are small, it is considered ok to use in raw food cuisine. Nutritional yeast is not raw too but it is widely used in raw food cooking, so it is kind of in the same category. Unfortunately, raw sesame oil does not taste anything like toasted sesame oil. Raw tahini will give it a tahini like flavor but not the toasty aromatic flavor toasted sesame oil gives. If you absolutely do not want to use the toasted sesame oil, you could use tahini instead, but you will have to add some raw sesame oil to it too to thin out the dressing. Let me know if you have any other questions!